We have been using QODBC without problems with our current QuickBooks version for months. Suddenly QODBC has stopped working on all our computers. I have tried a few different QODBC versions, including the latest, but none work. QODBC users are being faced with a QODBC message that "QODBC no longer licensed for this Reckon version"
Reinstalling and/or upgrading to v322 doesn't help. Some users still on v321 and the same message is coming up. QODBC Read Only edition was available for free with Reckon Pro/Premier/Enterprise till Oct 26, 2017. The contract for free use by Reckon Accounts users ended/terminated on the above date. To continue using QODBC for Reckon Accounts, Please purchase a QODBC License. 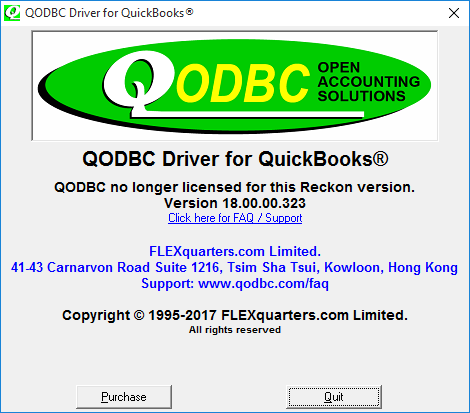 You can Purchase a QODBC License for Reckon Accounts by Clicking here or Visit http://qodbc.com/order.htm and then click "Asia Pacific"
You can get in touch with our Sales team for trial CDKEY query. They will help you with this query.